Game Center is the online gaming basis for many games in iOS and OS X, letting users play online, track scores, play against friends, it’s also generally required to use for almost every game played on an iPhone or iPad. When signing up for Game Center for the first time, plenty of us chose a nickname or username that was either our real names, an online nickname, or perhaps some oddball nickname, not really thinking much of the naming choice. Well, it turns out the Game Center nickname is entirely public, and it shows in games and in leaderboards, so once you realize that your fellow gamer friends, family, and coworkers can see that nickname too, you may decide “DrunkGuy69” or “IHateMyBoss420” wasn’t the best choice of usernames after all. But don’t freak out too bad, you can switch it out with something else! 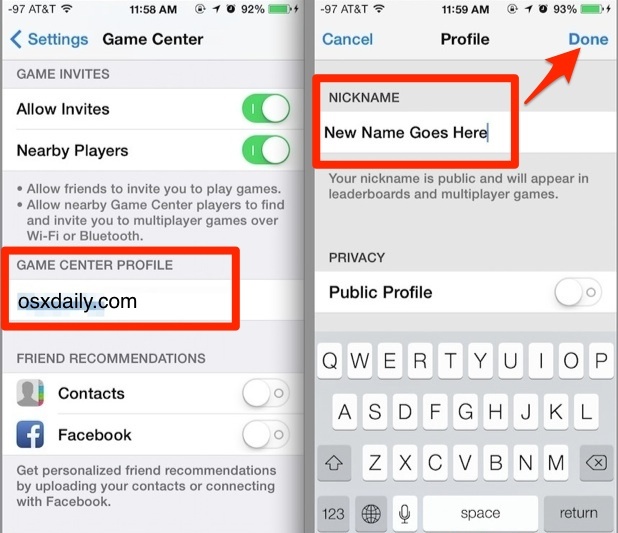 All iPad, iPhone, and iPod touch users can change the nickname that is shown through Game Center rather easily, the process is handled directly on their iOS devices and can be repeated as many times as necessary. Yes, that means if decide your new name isn’t that great either you can keep changing it until you’re happy. The change is immediate for unopened apps, but if you have an active online game open like Candy Crush or Clash of Clans and you just switched over to Settings through multitasking, you’ll probably want to quit out of it and re-open the app again to be certain the nickname change carries over. This basically forces the game in question to re-login to the Game Center servers where the change will be appear. Somewhat related, an optional setting for those who like a bit more privacy is to toggle the “Public Profile” setting to OFF while in that same Profile menu. This just prevents the profile (and nickname) from being visible to everyone, and instead only those in your Game Center friends list can see what games you’re playing and the scores. Now if only they’d remove the felt from the OS X app… and seriously, what’s the point of the app anyway? Oh! This is amazing! I’ve had a really awful GameCenter username since the days of iOS 4 and I guess I never really looked into changing it! Thank you! This is great! I was stuck with my Mum and Dad’s name but then I saw that my friend’s names had changed so I searched it up! It is not working for me, any other tips? or trouble shooting or settings I should change? It seems pretty obvious but it does not save the name it reverts it to the old one. Unfortunately this only works if the username isn’t already listed. I can’t believe Apple still uses a backward system that doesn’t lets you choose your own nickname, whilst it can ensure that you are you by your Apple Id. If not, what would be the use of this Apple ID anyway? Thanks. Helped me changed my GC name. Appreciated. DOPE BOI. Thanks! Can’t believe it’s just sitting in ‘Settings’ all along LOL! I’ve changed my name in game center but clash of clans still show the old one. I’ve deleted the app and dowload again…nothing happen…can you help me? OMG THANKYOU!!!. I had the most embarasing username on the Earth!! My friends all laughed at it when they saw it. Now its normal THANKS AGAIN! I would love to know if I change my Game Centre username does the old one become available to other players and if so when? I’m interested in starting a new account under a different email (my iCloud one not iTunes) and using that username but I don’t want to give it up if I can never get it back. These kinds of restrictions are the very definition of inflexibility. I complain to IT people who design systems like these all the time. Publicly visible names should never by unique or else you force people to have stupid names like #Myuniquename_23948! for instance. It’s just really dumb. Unique IDs should always be in the back end of systems and not visible so nobody cares what they are. I have changed my nickname at the Game Center several times hoping it’s gonna change my nickname when playing Hearts, but it never does. My old nickname seems to be glued to that game, whatever l do it won’t change. Log in, log out, turn the iPad off, turn it on, change the name, choose another one, delete the game, install it again,… Nothing works. I don’t have a Game Center option in my settings, what do I do?! … when I open Spades, it welcomes me with new nickname. When I start a game, old nickname is there. This won’t work. I’ve tried and there is no option to change names. I may have set it up for my kids a very long time ago, and I’m now stuck with an auto generated name Mol Eliza. Help? Really thanks a lot for this advice. Now, i can change my name in the game center.